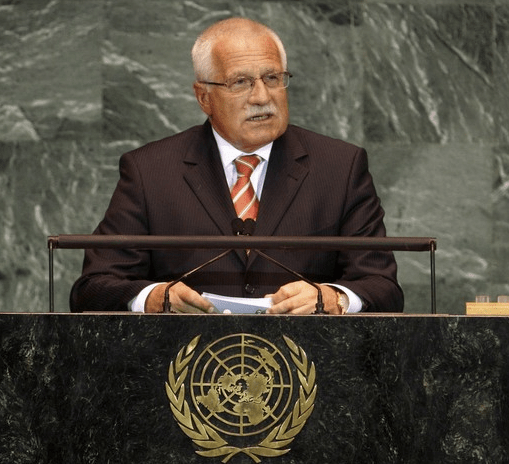 BY MICHAEL R. FOX PHD – The president of the Czech Republic, Vaclav Klaus has offered some remarkable observations about environmentalism and global warming and how the measures currently being proposed to curb climate change are a threat to human freedom. Klaus’s advice is especially important to Americans. I estimate there are at least two generations of Americans who have not been properly taught about the horrendous 20th century history of global communism, socialism, and other forms of totalitarianism. As such we are extremely vulnerable and uninformed about the deceptive practices of these governments and maltreatment of people who lived under these regimes during the last 100 years. Strong remnants of those days live on today in North Korea, Cuba, China, and elsewhere. Klaus’s advice is also important simply because he is a survivor and eye-witness to communism in Czechoslovakia as his native country was then known. It is easy for him to recognize totalitarian government agendas, and the corruption needed to foist them onto an unwary public (http://tinyurl.com/4oh68un). We should take his advice. He says that much of environmentalism and the measures proposed to curb climate change are threats to human freedom. These measures have very little to do with climate or with science. The data fudging, data losses, manipulations, and the remarkable unscientific bullying by many of the warmers only hint at the existence of non-scientific agendas. Klaus is known for calling climate change “a false myth” or a “nonsensical fiction”, and because of that he opposes the Kyoto Protocol on limiting greenhouse gas emissions. As time has passed Klaus’s description of the global warming fraud has become more and more accurate. After 20 years the global warmers have yet to provide observable, measurable, replicable evidence that man-made CO2 causes global warming. The totalitarian nature of global warming is seen in its own history. As we shall see there are anti-human, anti-freedom, and anti-capitalism hidden behind the rhetoric of global warming. There is no specific time in history when these forces behind global warming were organized to pursue anti-human goals. However, the United Nations currently is heavily involved with promoting the global warming fraud (no physical evidence) and has clearly stated as much in its IPCC mission statements. UN Totalitarianism Recently the United Nations Secretary General Ban-ki Moon clearly announced the UN attack on capitalism (http://tinyurl.com/4qkjson). Klaus’s words are coming true. The threat from UN Secretary General Moon makes very clear the historical attitudes of the UN in its opposition to freedom, liberty, and prosperity in the capitalist nations and elsewhere. This really isn’t a big surprise among those who have followed the UN’s inept history and activities, but it certainly removes all doubt about the attitudes within the membership of the UN toward the US and capitalism. This is a true menace for all who love freedom and prosperity. Historically, we learned from the 20th century events that international communism shares the same goals as those announced by Ban Ki Moon, which is the common hatred of capitalism and the West by Communism, Marxism, Leninism, you name it. The UN has been heavily and directly involved with orchestrating the global warming fraud and the junkscience it promotes. For example, the UN advisor Maurice Strong, a billionaire Canadian socialist, has been behind the UN Secretary General chair for years. He helped organize the United Nations Environmental Program (UNEP) which spun off the Intergovernmental Panel on Climate Change (IPCC). Strong also chaired the famous Rio Conference Earth Summit in 1992. There he made his famous statement that “Isn’t the only hope for the planet that the industrialized civilizations collapse? Isn’t it our responsibility to bring that about?” — Maurice Strong, head of the 1992 Earth Summit in Rio de Janeiro and Executive Officer for Reform in the Office of the Secretary General of the United Nations. [The Environmentalists’ Little Green Book, ISBN 0-615-11628-0]. The hatred for the US within the UN has been quite palpable for decades. I might also add that I had friends present at the Rio Conference featuring Strong’s amazing ugly statement. They report that Strong’s statement was met with thundering applause, include many of American environmental groups and the NGOs. The hateful attitudes of Moon are also embraced by much of the green movement within the US. Now think of Strong’s horrendous statement. Strong is an international a highly influential global player, who has worked behind the scenes at the UN for years to help carry out his goals. What kind of human would seek to collapse the industrialized civilizations, after he has accumulated billions from such nations in personal wealth? To help achieve this agenda Strong organized the UN’s Intergovernmental Panel on Climate Change (IPCC), with the goal of collapsing the industrialized nations. The global warming issue is crucial to this destructive agenda because if implemented, will help collapse these nations by collapsing these nations’ ability to generate electrical and transportation energy. IPCC Totalitarianism The founding papers of the IPCC state that “The role of the IPCC is toassess on a comprehensive, objective, open, and transparent basis the scientific, technical, and socio-economic information relevant to understanding the scientific basis of risk of human-induced climate change, its potential impacts and options for adaptation and mitigation. (quoted from (http://climaterealists.com/index.php?id=1447) and (http://tinyurl.com/4uqa2sc). Notice in these founding papers there is no interest on the part of the IPCC to fully understand the total forces on our climate from the sun, the oceans, the clouds, the cosmic radiation, and others, even some others still likely unknown. In other words, the scope is intentionally limited by the IPCC to only human effects on climate. Stated more clearly the IPCC has a very strong bias toward human-caused global warming, to the exclusion of other larger, natural forces. This dove-tails nicely with the threatening statement above by UN Secretary General Ban-ki Moon. Obviously, the IPCC has already concluded without physical, replicable evidence, that the “industrialized nations” are guilty as charged. The remaining IPCC effort and its allies is then to sift and select supportive evidence to establish capitalist culpability, no matter how contrived, to the exclusion of all other evidence of natural forces of warming and cooling brought about by solar forces, natural forces, natural CO2, and the others. American Totalitarianism The connection between communism and global warming is easily recognized by some of the GW bloggers as Klaus has warned. For example, the good folks at grist.org have expressed their doubts in the ability of an American democracy (we have a republic, btw), http://tinyurl.com/4nw5bar) to enact legislation on global warming. Grist raises the rhetorical question “Is a Communist Dictatorship the way to go.” The suggestion that communism is superior to free market capitalism, no matter how whimsical, is most inappropriate. There is more than a whiff of totalitarianism in this statement, which reflects the lack of historical illiteracy in the last 2 generations of the American public. They seem oblivious to what communism did to millions of citizens during the 20th century. Do we need to re-read “The Gulag Archipelago” by Solzhenitsyn, or the “Harvest of Sorrow” by Robert Conquest, or the “Heyday of American Communism” by Klehr, or the dozens of others which chronicled the mass murder of millions, and the horrendous deprivation and loss of freedom of the millions more who survived? This was not whimsical history. Totalitarians in the White House The Ban Ki Moon agenda regrettably has many supporters within the US. One of them is Van Jones, a former green jobs czar appointed by Obama (http://tinyurl.com/4t96lxb). Jones is a self-professed communist who now works for the Center for American Progress (http://tinyurl.com/7w9vs). Jones not only is a communist but also an amateur on energy issues. He has in the recent past promoted energy breakthroughs such as solar bulldozers, and solar buzz saws. Where is the outrage?. There are many more such people within the Obama administration who, as we are now witnessing, do not have the best interests of America or the American people in mind. Perhaps it is time to re-examine the mysterious history of our current president, his friends, mentors, advisors, and acquaintances (http://tinyurl.com/4shvny8). There are other czars equally powerful and frightening. These include Carolyn Browner member of the Socialist International (http://tinyurl.com/493at5c), Valerie Jarrett, (http://tinyurl.com/4e5jzue), Anita Dunn (http://tinyurl.com/4ko84hr), and the hopelessly inept John Holdren, Obama’s very own science advisor (http://tinyurl.com/4r4kt8c). Holdren has called for the de-industrialization of the West and redistribution of the wealth of those nations. Reminds me of the McCain/ Palin oft-repeated phrase during the campaign trail of ‘who is the real Barack Obama’ which would prompt hollers from the crowds at rallies of ‘terrorist’ and ‘kill him’. Ha ha ha… you guys crack me up sometimes.